Spencer has too many toys! He has robots, puzzles, board games, stuffed animals and plastic dinosaurs. Toys spill out of every drawer and closet, cluttering the floor of every room – and Mum has had enough! But Spencer can’t let Mum throw them out, because every single one is his favourite! Come along for the ride as Spencer tries to change his mother’s mind in David Shannon’s entertaining story, which proves that your own imagination is the best toy of all! 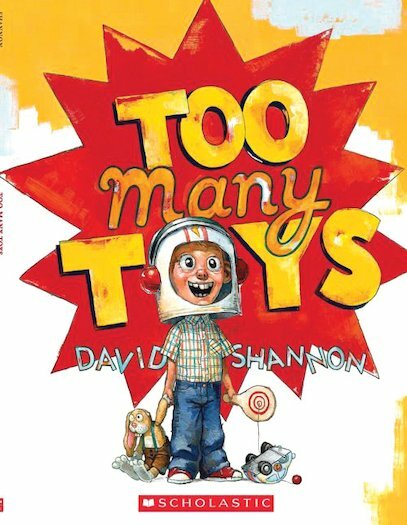 Caldecott Honor winner and ‘New York Times’ best-seller, David Shannon is the author / illustrator of the popular DAVID series, ‘No, David!’, ‘David Goes to School’ and ‘David Gets Into Trouble’. He was inspired to write his DAVID titles after his mother sent him a book he wrote as a little boy. It was illustrated with drawings of David doing all sorts of things he wasn’t supposed to do, and the text consisted entirely of the words ‘no’ and ‘David’! Once you step in to the ages of ‘David Gets in Trouble’ you’ll discover Shannon hasn’t slipped too far from this winning formula of his youth.